Hiddenite is a pale-to-emerald green variety of spodumene that is sometimes used as a gemstone. 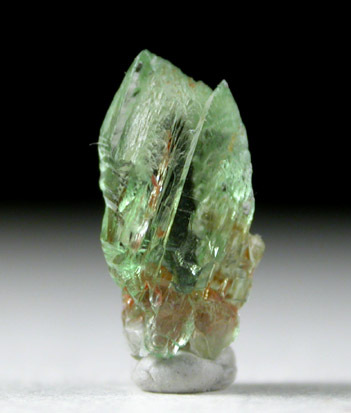 Hiddenite is the green gem variety of the mineral Spodumene. Spodumene is a common mineral, but only in several localities does it occur in transparent gem form. One gem form of Spodumene is Kunzite, the other important and much rarer form is Hiddenite. Hiddenite is named after William Earl Hidden, who was instrumental in identifying this new gemstone. 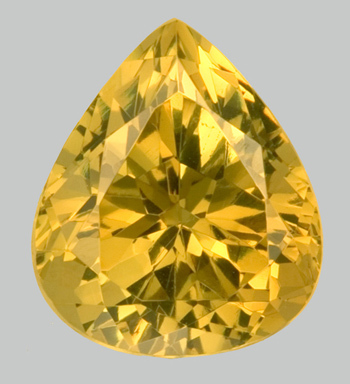 The town in North Carolina where this gemstone was found was subsequently given the name "Hiddenite" in honour of the gemstone. Hiddenite was named after W.E. Hidden, who discovered it in 1879 in North Carolina. Hidden travelled to North Carolina to find platinum for Thomas Edison's electric light bulb. Hidden leased Warren Farm to mine emeralds, and found hiddenite. Hiddenite is a green type of spodumene. Spodumene is green, pinkish or lilac and is used as a source of lithium. Hiddenite can appear green-yellow, yellow-green or a striking emerald-green. 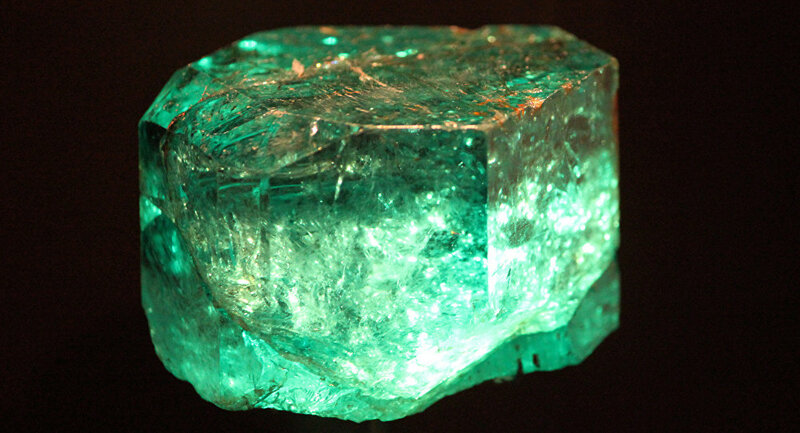 In fact, hiddenite was also referred to as the "lithia emerald" when mining of it reached its peak in the 1800s. This is because of its vivid green colour. 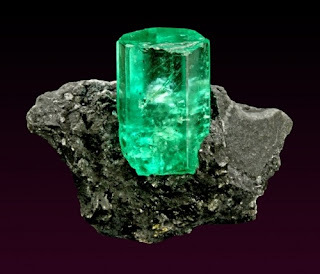 In fact, hiddenite was described in a newspaper in 1892, by Kunz, as being having a "peculiar brilliancy which is wanting in true emerald". Hiddenite is popular with collectors and museums. Hiddenite's pleochroism can help to distinguish it from other gems. A combination of this, its perfect cleavage, hardness, monoclinic crystal system, transparency and colour can distinguish hiddenite from other gems. The mining area of North Carolina, USA, where hiddenite was discovered, has been named Hiddenite, after the gem. The Emerald Hollow Mine in Hiddenite is open to the public. 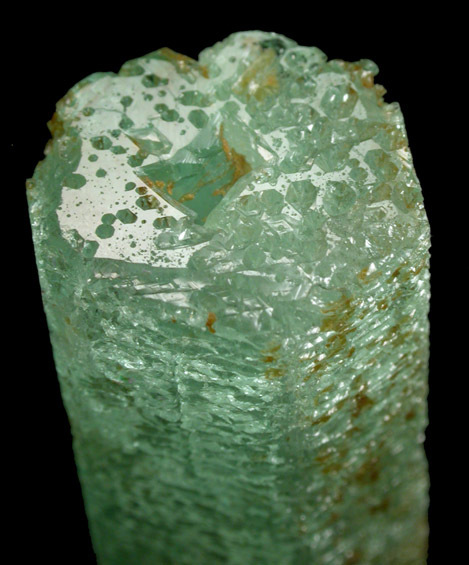 Deposits of hiddenite have also been found in Afghanistan, Myanmar (Burma), Brazil, Madagascar and California. Grossular is a calcium-aluminium species of the garnet group of minerals. It has the chemical formula of Ca3Al2(SiO4)3 but the calcium may, in part, be replaced by ferrous iron and the aluminium by ferric iron. The name grossular is derived from the botanical name for the gooseberry, grossularia, in reference to the green garnet of this composition that is found in Siberia. Other shades include cinnamon brown (cinnamon stone variety), red, and yellow. Grossular is a gemstone. 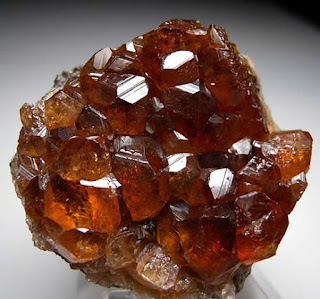 Hessonite or Cinnamon Stone, is a more common variety of grossular with the general formula: Ca3Al2Si3O12. 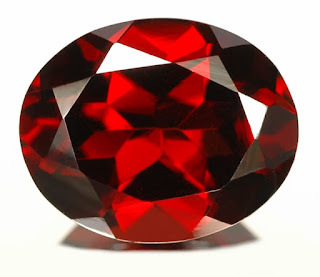 The name comes from the Ancient Greek: ἣσσων (hēssōn), meaning inferior; an allusion to its lower hardness and lower density than most other garnet species varieties. It has a characteristic red colour, inclining to orange or yellow, much like that of zircon. It was shown many years ago, by Sir Arthur Herbert Church, that many gemstones, especially engraved gems (commonly regarded as zircon), were actually hessonite. The difference is readily detected by the specific gravity, that of hessonite being 3.64 to 3.69, while that of zircon is about 4.6. Hessonite has a similar hardness to that of quartz (being about 7 on the mohs scale), while the hardness of most garnet species is nearer 7.5. Hessonite comes chiefly from Sri Lanka and India where it is found generally in placer deposits, though its occurrence in its native matrix is not unknown. It is also found in Brazil and California. Grossular is found in contact metamorphosed limestones with vesuvianite, diopside, wollastonite and wernerite. A highly sought after variety of gem garnet is the fine green Grossular garnet from Kenya and Tanzania called tsavorite. This garnet was discovered in the 1960s in the Tsavo area of Kenya, from which the gem takes its name. Viluite is a variety name of grossular, that is not a recognized mineral species. It is usually olive green though sometimes brownish or reddish, brought about by impurities in the crystal. 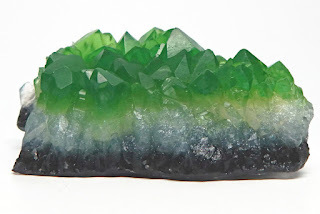 Viluite is found associated with and is similar in appearance to vesuvianite, and there is confusion in terminology as viluite has long been used as a synonym for wiluite, a sorosilicate of the vesuvianite group. This confusion in nomenclature dates back to James Dwight Dana. It comes from the Vilyuy river area in Siberia. Grossular is known by many other names, and also some misnomers; colophonite coarse granules of garnet, ernite, gooseberry-garnet light green coloured and translucent, olyntholite/olytholite, romanzovite, and tellemarkite. Misnomers include South African jade, garnet jade, Transvaal jade, and African jade. Goshenite is the white to colourless variety of Beryl. Beryl is best known for its gem varieties Emerald and Aquamarine, as well as the lesser known Heliodor and Morganite, but the variety Goshenite less frequently used as a gemstone being that it lacks the colour appeal of the other varieties. Since all these colour varieties are caused by impurities and pure beryl is colourless, it might be tempting to assume that goshenite is the purest variety of beryl. However, there are several elements that can act as inhibitors to colour in beryl and so this assumption may not always be true. The name goshenite has been said to be on its way to extinction and yet it is still commonly used in the gemstone markets. Goshenite is found to some extent in almost all beryl localities. In the past, goshenite was used for manufacturing eyeglasses and lenses owing to its transparency. Nowadays, it is most commonly used for gemstone purposes and also considered as a source of beryllium. The gem value of goshenite is relatively low. However, goshenite can be coloured yellow, green, pink, blue and in intermediate colours by irradiating it with high-energy particles. The resulting colour depends on the content of Ca, Sc, Ti, V, Fe, and Co impurities. 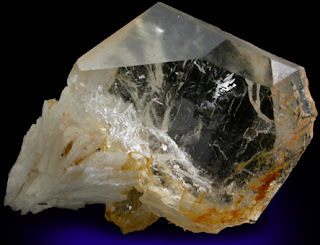 Named for its major discovery in Goshen, Massachusetts, USA, Goshenite is the purest form of Beryl, containing fewer impurities than the coloured varieties. It is an aluminium beryllium silicate mineral that forms in prismatic or vertically striated crystals, sometimes terminated by small pyramidal faces. 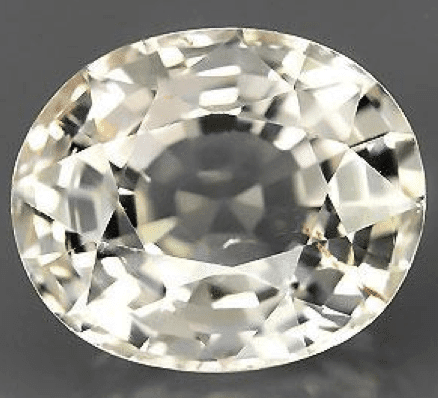 It is transparent to translucent, with a vitreous luster. Though the gem value is relatively low, it is most commonly used for gemstone or metaphysical purposes, and considered as a source of beryllium. While Goshenite is the colourless variety of Beryl, the Beryl family also forms in other colours used as gems, such as green Emerald, blue Aquamarine, yellow Heliodor and Golden Beryl, Red Beryl or Bixbite, and pink Morganite. 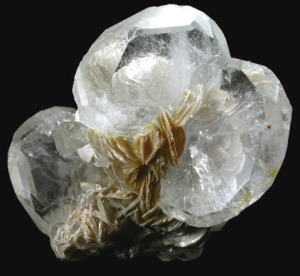 Used in combination, Goshenite enhances the energies of all Beryls and increases their healing and transformative properties. 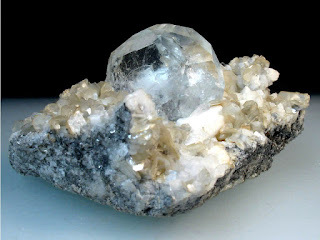 Goshenite was first discovered in the small town of Goshen, located in Hampshire County of Western Massachusetts. Today, goshenite and other deposits of beryl, can be found all around the world. Before the introduction of synthetic diamonds, goshenite was often used as a diamond alternative. By the placement of silver or green foil under the stone, goshenite can even be used as alternatives for emeralds and other precious coloured stones. The coloured foil enhances goshenite's colour similar to the way 'coating' can enhance mystic quartz or topaz. Goshenite was once used for the manufacturing of eyeglasses, because of its excellent transparency. 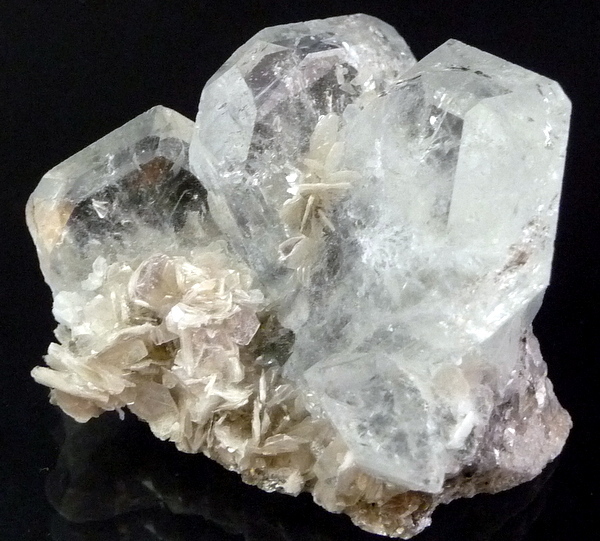 Goshenite is also considered an excellent source for beryllium. Goshenite, like all beryl, has excellent hardness, durability and toughness. It is very resistant to corrosive materials, but goshenite is considered to be quite brittle and sensitive to pressure. There are a number of different gems that closely resemble goshenite, including quartz, white topaz, white zircon and white sapphire. However, beryl can usually be easily distinguished from other similar gems through basic testing. One of the easiest testing methods to identify goshenite is by testing for specific gravity (density) and hardness. Goshenite is significantly harder than quartz and feldspar, but slightly softer than topaz and sapphire. Beryl, topaz and sapphire all have very different crystal structures, making beryl quite distinct due to its unique six-sided hexagonal crystal formation. Although goshenite is named after the small town of Goshen, Massachusetts, it can be found all over the world including North and South America, China, Canada, Russia, Mexico, Colombia, Brazil, Northern Europe, Africa and Asia. It is thought that the largest, cleanest and best quality material is found in Brazil. Gold is a chemical element with the symbol Au (from Latin: aurum) and the atomic number 79. In its purest form, it is a bright, slightly reddish yellow, dense, soft, malleable and ductile metal. Chemically, gold is a transition metal and a group 11 element. It is one of the least reactive chemical elements, and is solid under standard conditions. The metal therefore occurs often in free elemental (native) form, as nuggets or grains, in rocks, in veins and in alluvial deposits. It occurs in a solid solution series with the native element silver (as electrum) and also naturally alloyed with copper and palladium. Less commonly, it occurs in minerals as gold compounds, often with tellurium (gold tellurides). No precious metal is as legendary and beautiful as Gold. Its rarity, beauty, and enigma have provided it with status as a valuable commodity throughout the history of humanity. Gold has always been used as a monetary standard, and ancient gold jewellery and ornaments dating back centuries have been found throughout the world. Gold has always been and remains the most essential jewellery component, with most precious jewellery pieces created from Gold or inlaid with a Gold setting. Gold resists attack by individual acids, but aqua regia (literally "royal water", a mixture of nitric acid and hydrochloric acid) can dissolve it. The acid mixture causes the formation of a soluble tetrachloroaurate anion. It is insoluble in nitric acid, which dissolves silver and base metals, a property that has long been used to refine gold and to confirm the presence of gold in metallic objects, giving rise to the term acid test. Gold also dissolves in alkaline solutions of cyanide, which are used in mining and electroplating. Gold dissolves in mercury, forming amalgam alloys, but this is not a chemical reaction. 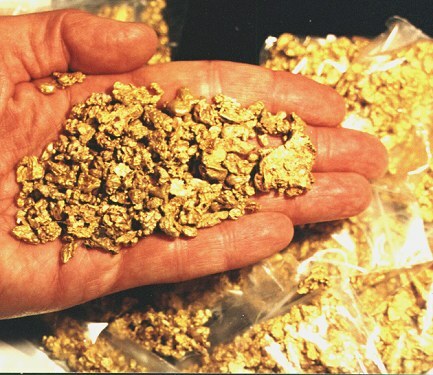 Gold is a precious metal used for coinage, jewellery, and other arts throughout recorded history. In the past, a gold standard was often implemented as a monetary policy within and between nations, but gold coins ceased to be minted as a circulating currency in the 1930s, and the world gold standard was abandoned for a fiat currency system after 1976. The historical value of gold was rooted in its relative rarity, easy handling and minting, easy smelting and fabrication, resistance to corrosion and other chemical reactions (nobility), and distinctive colour. 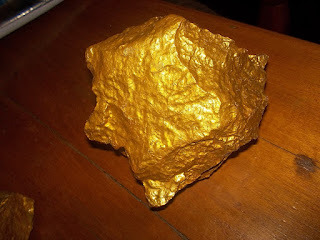 Gold is the most malleable of all metals; a single gram can be beaten into a sheet of 1 square meter, and an avoirdupois ounce into 300 square feet. Gold leaf can be beaten thin enough to become semi-transparent. The transmitted light appears greenish blue, because gold strongly reflects yellow and red. Such semi-transparent sheets also strongly reflect infrared light, making them useful as infrared (radiant heat) shields in visors of heat-resistant suits, and in sun-visors for spacesuits. 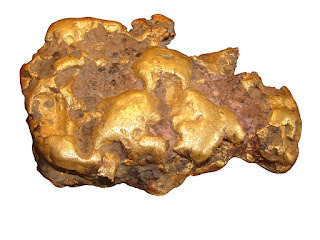 Gold is a good conductor of heat and electricity and reflects infrared radiation strongly. 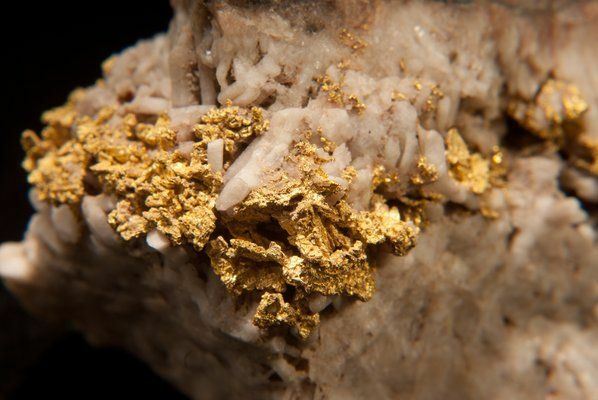 Gold has a density of 19.3 g/cm3, almost identical to that of tungsten at 19.25 g/cm3; as such, tungsten has been used in counterfeiting of gold bars, such as by plating a tungsten bar with gold, or taking an existing gold bar, drilling holes, and replacing the removed gold with tungsten rods. By comparison, the density of lead is 11.34 g/cm3, and that of the densest element, osmium, is 22.588 ± 0.015 g/cm3. Garnet is the name used for a large group of rock-forming minerals. All species of garnets possess similar physical properties and crystal forms, but differ in chemical composition. The different species are pyrope, almandine, spessartine, grossular (varieties of which are hessonite or cinnamon-stone and tsavorite), uvarovite and andradite. 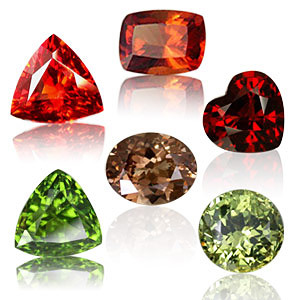 The garnets make up two solid solution series: pyrope-almandine-spessartine and uvarovite-grossular-andradite. These minerals are found throughout the world in metamorphic, igneous, and sedimentary rocks. Most garnet found near Earth's surface forms when a sedimentary rock with a high aluminium content, such as shale, is subjected to heat and pressure intense enough to produce schist or gneiss. Garnet is also found in the rocks of contact metamorphism, subsurface magma chambers, lava flows, deep-source volcanic eruptions, and the soils and sediments formed when garnet-bearing rocks are weathered and eroded. Most people associate the word "garnet" with a red gemstone; however, they are often surprised to learn that garnet occurs in many other colours and has many other uses. In the United States, the major industrial uses of garnet in 2012 were water-jet cutting (35%), abrasive blasting media (30%), water filtration granules (20%), and abrasive powders (10%). 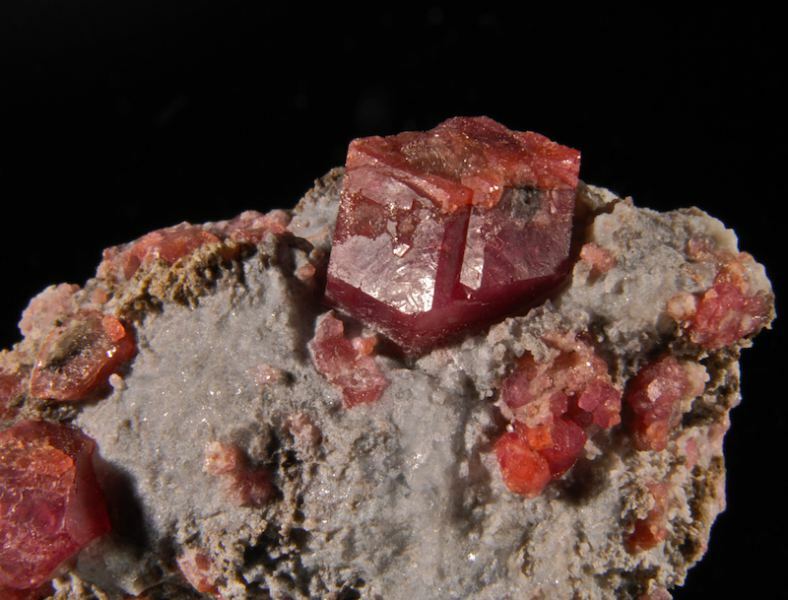 The most commonly encountered minerals in the garnet group include almandine, pyrope, spessartine, andradite, grossular, and uvarovite. They all have a vitreous luster, a transparent-to-translucent diaphaneity, a brittle tenacity, and a lack of cleavage. They can be found as individual crystals, stream-worn pebbles, granular aggregates, and massive occurrences. Their chemical composition, specific gravity, hardness, and colours are listed below. The compositions listed above are for end members of several solid solution series. There are a number of other garnet minerals that are less frequently encountered and not as important in industrial use. They include goldmanite, kimzeyite, morimotoite, schorlomite, hydrogrossular, hibschite, katoite, knorringite, majorite, and calderite. As seen above, there are a variety of different types of garnet, and each has a different chemical composition. There are also solid solution series between most of the garnet minerals. This wide variation in chemistry determines many of their physical properties. As an example, the calcium garnets generally have a lower specific gravity, a lower hardness and are typically green in colour. In contrast, the iron and manganese garnets have a higher specific gravity, a greater hardness and are typically red in colour. 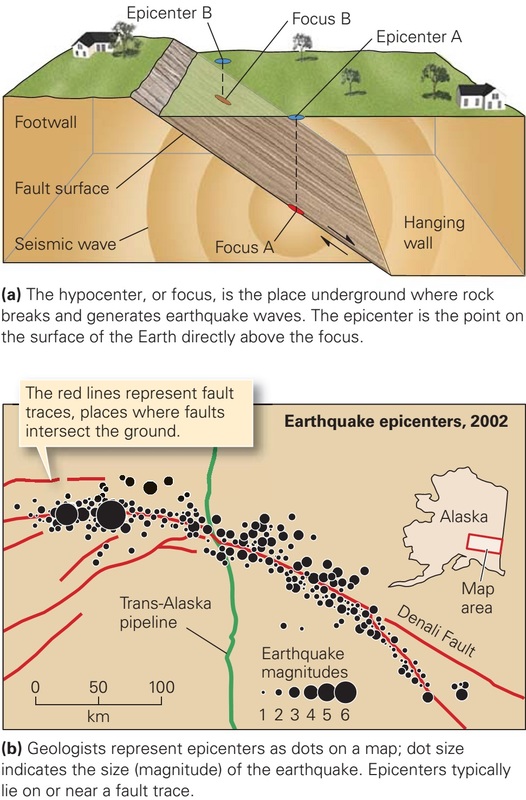 Most garnet forms at convergent plate boundaries where shale is being acted upon by regional metamorphism. The heat and pressure of metamorphism breaks chemical bonds and causes minerals to recrystallise into structures that are stable under the new temperature-pressure environment. The aluminum garnet, almandine, generally forms in this environment. As these rocks are metamorphosed, the garnets start as tiny grains and enlarge slowly over time as metamorphism progresses. As they grow, they displace, replace, and include the surrounding rock materials. The photo below shows a microscopic view of a garnet grain that has grown within a schist matrix. 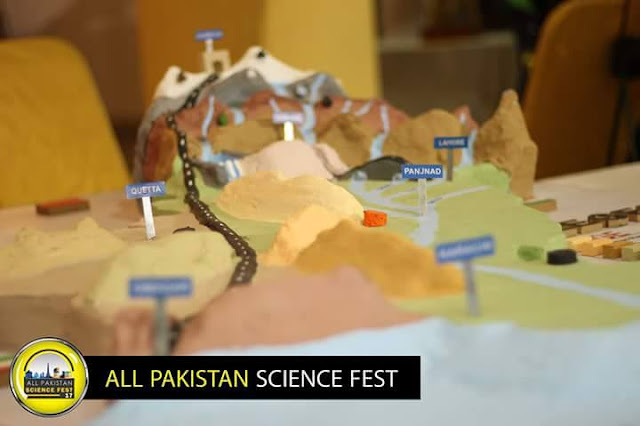 It included a number of the host rock's mineral grains as it grew. 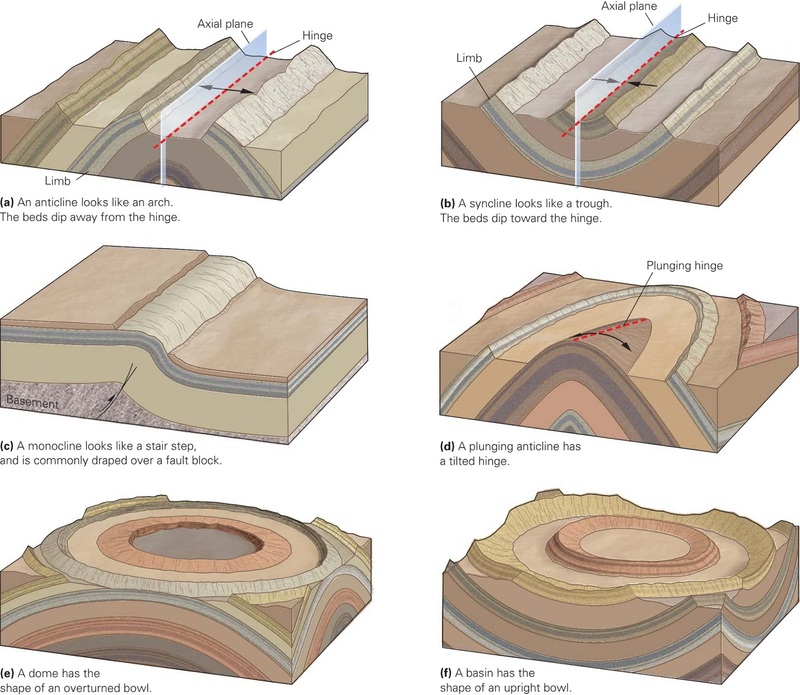 This explains why so many garnets formed by regional metamorphism are highly included. 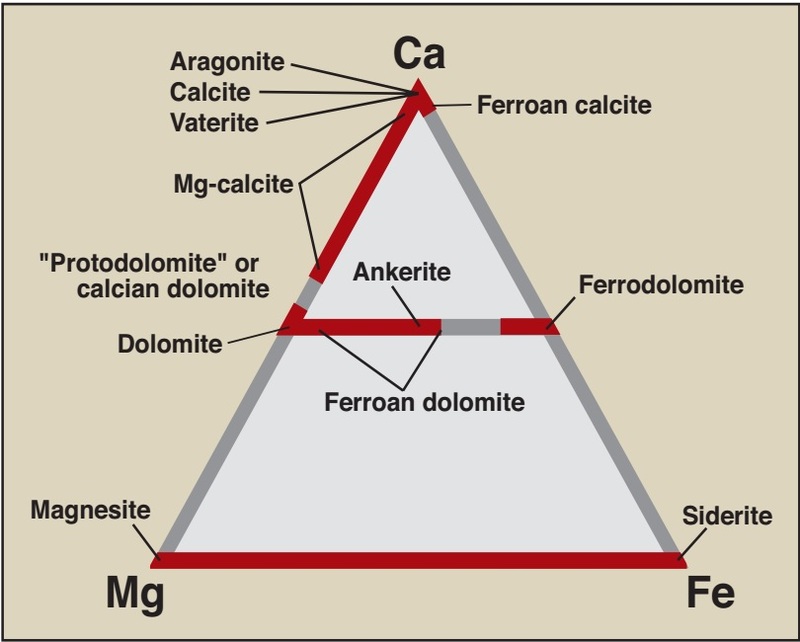 The calcium garnets typically form when argillaceous limestone is altered into marble by contact metamorphism along the edges of igneous intrusions. These are andradite, grossular, and uvarovite, the slightly softer, typically green garnets with a lower specific gravity. Two calcium garnets are highly regarded in the gem trade; they are tsavorite (a bright green grossular) and demantoid (a golden-green andradite). Garnet often occurs as an accessory mineral in igneous rocks such as granite. Many people are familiar with almandine garnet because it is sometimes seen as dark red crystals in the igneous rocks used as granite countertops. 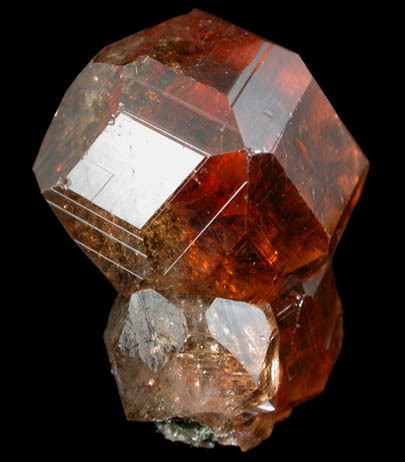 Spessartine is an orange garnet found as crystals in granite pegmatites. 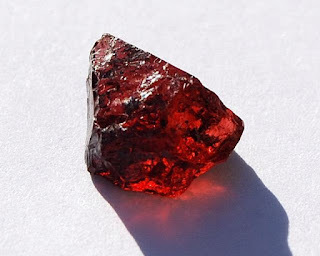 Pyrope is a red garnet that is brought to Earth's surface in pieces of peridotite that were torn from the mantle during deep-source volcanic eruptions. Garnet is also found in basaltic lava flows. Garnets are relatively durable minerals. They are often found concentrated in the soils and sediments that form when garnet-bearing rocks are weathered and eroded. These alluvial garnets are often the target of mining operations because they are easy to mine and remove from the sediment/soil by mechanical processing. Garnet has been used as a gemstone for thousands of years. In the past 150 years, it has seen many additional uses as an industrial mineral. The chart below shows recent industrial uses of garnet in the United States. Garnet is also used as an indicator mineral during mineral exploration and geologic assessments. The first industrial use of garnet was as an abrasive. Garnet is a relatively hard mineral with a hardness that ranges between 6.5 and 7.5 on the Mohs Scale. That allows it to be used as an effective abrasive in many types of manufacturing. When crushed, it breaks into angular pieces that provide sharp edges for cutting and sanding. Small granules of uniform size are bonded to paper to produce a reddish color sandpaper that is widely used in woodworking shops. Garnet is also crushed, screened to specific sizes, and sold as abrasive granules and powders. In the United States, New York and Idaho have been important sources of industrial garnet for abrasives. The largest industrial use of garnet in the United States is in waterjet cutting. A machine known as a waterjet cutter produces a high-pressure jet of water with entrained abrasive granules. When these are directed at a piece of metal, ceramic, or stone, a cutting action can occur that produces very little dust and cuts at a low temperature. Waterjet cutters are used in manufacturing and mining. Garnet granules are also used in abrasive blasting (commonly known as "sand blasting"). In these processes, a tool propels a stream of abrasive granules (also known as "media") against a surface using a highly pressurized fluid (usually air or water) as a propellant. Abrasive blasting is done in order to smooth, clean, or remove oxidation products from metals, brick, stone, and other materials. It is usually much faster than sanding by hand or with a sanding machine. It can clean small and intricate surfaces that other cleaning methods would miss. Abrasives of various hardnesses can be used to clean a surface of greater hardness, without damaging the surface. Garnet granules are often used as a filter media. Small garnet particles are used to fill a container through which a liquid flows. The pore spaces of the garnet are small enough to allow passage of the liquid but are too small to allow passage of some contaminant particles, which are filtered from the flow. Garnet is suited for this use because it is relatively inert and has a relatively high specific gravity. Garnet granules, crushed and graded to about 0.3 millimetres in size, can be used to filter out contaminant particles as small as a few microns in diameter. Garnet's high specific gravity and high hardness reduce bed expansion and particle abrasion during back flushing. 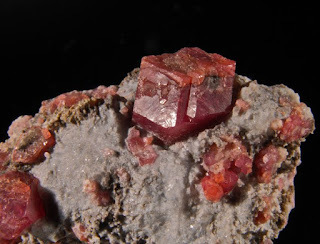 Although most of the garnets found at Earth's surface have formed within the crust, some garnets are brought up from the mantle during deep-source volcanic eruptions. These eruptions entrain pieces of mantle rock known as "xenoliths" and deliver them to the surface in a structure known as a "pipe." These xenoliths are the source of most diamonds found at or near Earth's surface. Although xenoliths contain diamonds, they often contain a tremendous number of garnets for every diamond, and those garnets are generally larger in size. These deep-source garnets are very different from the garnets that form in the crust at shallow depth. 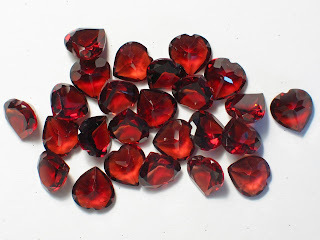 So, a good way to prospect for diamonds is to look for these unique garnets. The garnets serve as "indicator minerals" for geologists exploring for diamond deposits. As the xenoliths weather, their garnets are liberated in large numbers. These unusual garnets then move downslope in soils and streams. Geologists who find them can follow the garnet trail to the source deposit. Some of the diamond pipes in Canada were found by following a garnet trail produced by moving ice. Garnet has been used as a gemstone for over 5000 years. It has been found in the jewellery of many Egyptian burials and was the most popular gemstone of Ancient Rome. 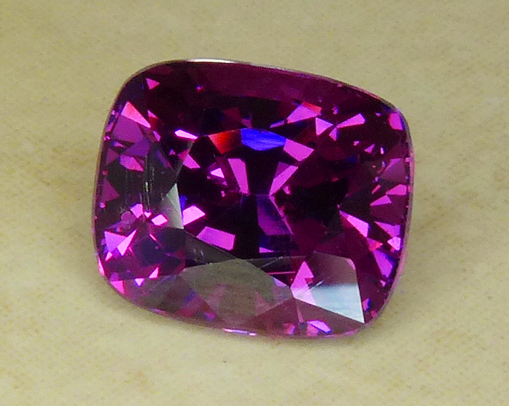 It is a beautiful gem that is usually sold without treatment of any kind. It is also durable and common enough that it can be used in jewellery at a relatively low cost. Garnet continues as a popular gemstone today. It serves as a birthstone for the month of January and is a traditional gem given on a second anniversary. 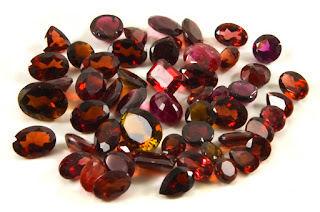 Most people will think of a red gemstone when they hear the name "garnet" because they are not aware that garnet occurs in a variety of colours. However, gem-quality garnets occur in every colour with red being the most common and blue garnets being especially rare. Red almandine is the red garnet most often found in jewellery because it is abundant and inexpensive. Pyrope and spessartine are reddish garnets that are commonly encountered in jewellery for the same reason. 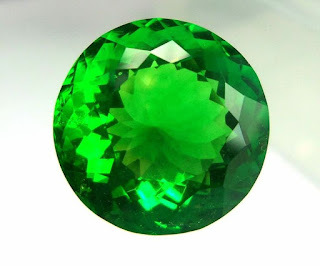 In recent decades, green demantoid garnet has become popular. It has a dispersion of 0.057 that gives it a "fire" which exceeds that of diamond's at 0.044. Green tsavorite has a bright, rich colour that is very much like emerald. It is commonly used as an alternative stone to emerald. Both of these green garnets are becoming more popular, but their price is much higher than almandine. Chemical Formula Garnet is a series of several different minerals with unique chemical formulas. See The chemical formula of Garnet above for details. Emerald is a gemstone and a variety of the mineral beryl (Be3Al2(SiO3)6) coloured green by trace amounts of chromium and sometimes vanadium. Beryl has a hardness of 7.5–8 on the Mohs scale.Most emeralds are highly included, so their toughness (resistance to breakage) is classified as generally poor. Emerald is a cyclosilicate. Natural, transparent Emerald is one of four “precious” gemstones (including Diamond, Ruby and Sapphire), and is the green variety of Beryl, a beryllium aluminium silicate mineral coloured by trace amounts of chromium and/or vanadium. Emerald occurs in hues ranging from yellow-green to blue-green, with the finest being a pure verdant green hue, medium to dark in tone. 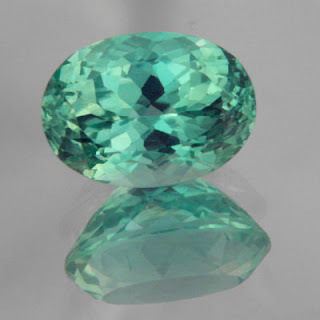 Light coloured gems are usually known by the species name, Green Beryl. Most Emeralds are highly included with surface breaking fissures, so their toughness, or resistance to breakage, is usually classified as generally poor. According to Indian lore, the name Emerald was first translated from Sanskrit as Marakata, meaning “the green of growing things.” The term we use today is believed to derive from an ancient Persian word that translated to the Greek as Smaragdus, meaning “green stone,” the term used in antiquity and referred to a number of other green stones. Over time the Old French or Vulgar Latin versions, Esmeraulde, Esmaraldaor Esmaraldus became the current name, Emerald. Zambia is the world's second biggest producer, with its Kafubu River area deposits (Kagem Mines) about 45 km (28 mi) southwest of Kitwe responsible for 20% of the world's production of gem quality stones in 2004. In the first half of 2011 the Kagem mines produced 3.74 tons of emeralds. Emeralds are found all over the world in countries such as Afghanistan, Australia, Austria, Brazil, Bulgaria, Cambodia, Canada, China, Egypt, Ethiopia, France, Germany, India, Italy, Kazakhstan, Madagascar, Mozambique, Namibia, Nigeria, Norway, Pakistan, Russia, Somalia, South Africa, Spain, Switzerland, Tanzania, United States, Zambia, and Zimbabwe. In the US, emeralds have been found in Connecticut, Montana, Nevada, North Carolina, and South Carolina. In Canada, in 1997 emeralds were discovered in the Yukon. Dumortierite is a fibrous variably coloured aluminium boro-silicate mineral, Al7BO3(SiO4)3O3. 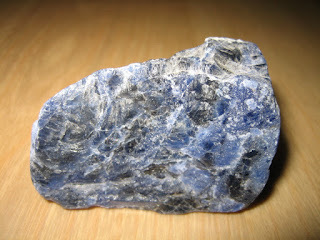 Dumortierite crystallises in the orthorhombic system typically forming fibrous aggregates of slender prismatic crystals. The crystals are vitreous and vary in colour from brown, blue, and green to more rare violet and pink. Substitution of iron and other tri-valent elements for aluminium result in the colour variations. It has a Mohs hardness of 7 and a specific gravity of 3.3 to 3.4. Crystals show pleochroism from red to blue to violet. Dumortierite quartz is blue coloured quartz containing abundant dumortierite inclusions. Dumortierite was first described in 1881 for an occurrence in Chaponost, in the Rhône-Alps of France and named for the French paleontologist Eugène Dumortier (1803–1873). It typically occurs in high temperature aluminium rich regional metamorphic rocks, those resulting from contact metamorphism and also in boron rich pegmatites. The most extensive investigation on dumortierite was done on samples from the high grade metamorphic Gfohl unit in Austria. Sources of Dumortierite include Austria, Brazil, Canada, France, Italy, Madagascar, Namibia, Nevada, Norway, Peru, Poland, Russia and Sri Lanka. 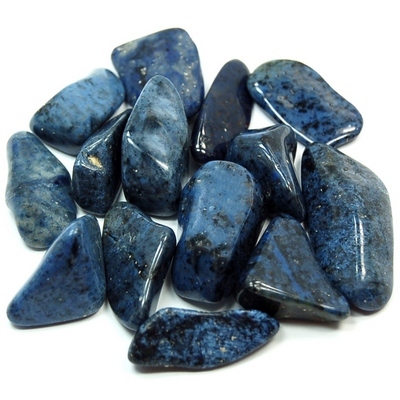 This Tumbled Dumortierite is a wonderful shade of blue and is mined in Africa. 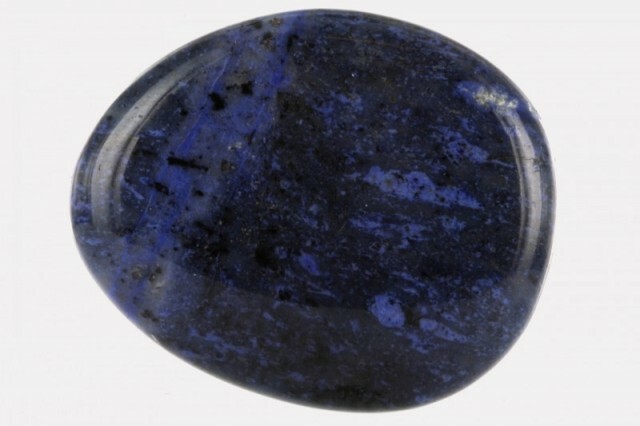 Usually found in deposits near water, Dumortierite was once called "Petrified Water" by some of its discoverers. The variety of blue color in Blue Dumortierite can come from manganese, iron, and/or zinc inclusions.